Captain Samuel Edison. Detail from a portrait in the Edison Museum, Vienna, Ontario. The Edisons originated in Holland and John, Patriarch of the Edisons in Upper Canada, came to America with his widowed mother as a child of three about 1730. John and his wife Sarah (Ogden) Edison were eventually to become the great-grandparents of the famous Thomas Alva Edison. John Edison was first recorded in Bayham Township, Elgin County on a map dated 1809. He and his wife Sarah choose Lot 8 in Concession 1, overlooking Lake Erie. Four of his sons came to Elgin County at the same time; and the remaining family came in 1811, along with the John Saxton family. During the Colonial War of Independence against England, John remained a loyal member of His Majesty’s Colony in New Jersey and supported the Crown. Only the intervention of his wife’s family, the influential Ogdens, who were Patriots, saved John from execution when the war ended. In 1783, with their cause lost, his house burned and his lands confiscated, John and his family fled the United States. A muster roll of Loyalists taken at Digby, Nova Scotia, on May 29, 1784, records John Edison and his family of nine, consisting of one man, one woman, four children over ten years and three children under ten years. 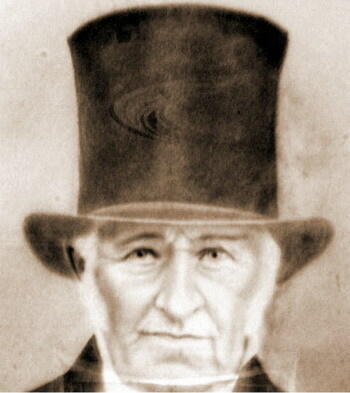 Though 80 years old, John decided to take up Col. Talbot’s offer of land and agreed to re-settle once again, this time in south Bayham, London District (now Elgin County). He and his extended family, most of them married with children of their own, along with another related family, that of John Saxton, took up multiple Crown Grants in the Bayham vicinity. As a result, the first concession was named and still remains Nova Scotia Line. >P> John Edison passed away shortly after this move, in 1814. He, along with his wife, was buried on their own farm, just west of Port Burwell, in Lot 8, Concession 1. Because the final Patent for the land wasn’t received until 1816, his name was never officially on the land records and the grant was instead placed under the name of his son Moses, who was also granted Lot 7, Concession 1. It was Samuel, eldest son of John, and his wife Nancy (Simpson) whose family became the famous Edisons of Vienna. At the beginning of the War of 1812, Col. Talbot reported that he had located eighty (80) settlers in Malahide and Bayham Townships, the majority being from the Maritimes. They had settled along or close by the first concession, then known as Nova Scotia Street. Several of these pioneers readily enlisted in the First Middlesex Regiment, commanded by Col. Talbot, when war broke out between the British and the Americans shortly afterwards. Of special assistance to Col. Talbot were Lt. Col. Burwell, Major Eakins, Captain Sam Edison, Lieutenant William Saxton and Ensign Defields. The majority of the Maritime Pioneers in the vicinity, including the Edisons, were Baptists. For years the services were held in Joseph Elder Merrill’s house. Then about 1835 or 1836, Elder Merrill donated this land at Lot 12, Concession 2 for a church and cemetery. The first Baptist Church, a large imposing building with galleries on three sides and a seating capacity of about 500 people, was built here beside the Old John Edison Cemetery. Sitting in Council with these Bayham religious pioneers at Dowland’s [Dowlin] home (he being a son-in-law of John Edison,) were representatives from the Charlotteville and Oxford churches and missionary Simon Mabee. They proceeded to examine the letters of the 10 Bayham members. Mabee then baptized four new members - John and Elizabeth Sibley and Samuel and Nancy Edison. The Church expanded rapidly at this time, however, adding nearly ten new members annually. As well, several had the right hand of fellowship withdrawn for disorderly walking or immoral conduct, including Sam Edison. Captain Sam, a son of John, who had served under Talbot in the (war and) who had donated land for the Vienna cemetery, was excluded for refusing to obey the voice of the church, less than two months after he became a member! Perhaps also the congregation had kept in mind the fact that Edison had been charged with assault and fined in a dispute with a fellow settler just two years before, when he was 55 years old. Captain Sam died on March 27, 1865 at the age of 103 years. He was buried in the Edison Pioneer Cemetery which is located off of King Street in Vienna. 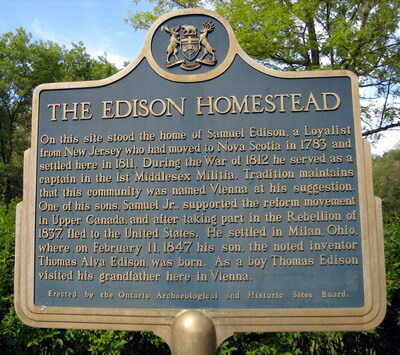 Plaque on the site of the Edison Homestead in Vienna, Ontario. Samuel Jr. carried on his father’s example of being a "True Spirit". During the exciting days of Rebellion in 1836-37, Sam took on the politics of the Reformers and an active part with the Rebels. "...as a 33-year old, Nova Scotian (American), 26 years in province, Regular Baptist, innkeeper, married his wife was Nancy Elliott, a local school teacher, who was born in New York State in 1810, Her father a Baptist minister and a descendant of an old Revolutionary soldier of Scottish descent, married in Vienna about 1828. "He joined the insurgents as a protest against officialdom, became a captain in the rebel forces, and when the insurrection was suppressed, fled to the United States, and after spending five years in various towns along the southern shore of Lake Erie, settled in Milan, Ohio, in 1842. There, five years later, Thomas Alva Edison was born." The Old John Edison Cemetery was located in Lot 8, Concession 1, approximately 100 metres south of Nova Scotia Line. While this cemetery no longer exists, the notes of Ida Louisa Haggan state that the grave stones of Adonijah Edison and his daughter Marcia, Caleb Hains, and Marcus Harrison were once buried here before being moved to other area cemeteries. The lot itself belonged to John Edison, great-grandfather of Thomas Alva Edison. Most of the Edison family is now buried in this Edison Pioneer Cemetery, peacefully resting with their Otter Valley in view. To locate the Edison Pioneer Cemetery follow Plank Road south of Vienna, to King Street and watch for the signage pointing the way. While few know of the cemetery’s existence, it is one of Vienna’s closest links to the Edison family. With the graves of Captain Samuel Edison Sr, paternal grandfather of Thomas Alva Edison, and many other members of the Edison family, this cemetery is a definite must-see for all Edison enthusiasts. A "Cemetery and Church Guide" can be purchased at the Edison Museum of Vienna and it contains a list of those buried at the Edison Pioneer Cemetery. In 1958, Nora Edison Coombe, the first half-cousin of Thomas Alva Edison, suggested that the Edison Pioneer Cemetery be restored. Reeve K. C. Emerson arranged for the Otter Creek Conservation Authority to put a fence around the cemetery. In 1963, the cemetery was under the Township of Bayham’s jurisdiction and a cemetery board was formed. Board trustees included K. C. Emerson, Jerry Seghers and Jack Petrie. 1965 saw the cemetery reclaimed and completed. A road was cleared and gravestones were relocated and repaired. A mill-stone monument, taken from a local flour mill was placed at the entrance. Reverend R. J. Dungey, rector of the Trinity Anglican Church in Vienna, blessed the monument. A plaque, placed on the stone, recognized Captain Samuel Edison, UEL, for his donation of this one-acre plot, which we now know as the Edison Pioneer Cemetery. The plaque was later damaged and consequently removed. The following is a list of John and Sarah Edison’s children and their respective settlement locations. There was also one other daughter, Phoebe, who died in infancy. Marcellus (relation not known)& Susanna (Rupe) C3 Lot 18 1809 ? *note #1 Adonijah Edison, who married Nancy Williams, is reported as having been killed in 1825 while raising a barn on his farm, Lot 4, Concession 1, and was buried in the first Edison Cemetery on Lot 8 Concession 1. J.N. Vanamburgh received the crown grant (1816) for this farm, although Adonijah may have first settled on it. *note #2 This was the home farm where John and Sarah settled. *note #3 According to the map of Crown Grants from the I. Haggan papers, Geo. Wm. Hollowood is named and the date of patent 1840. *note #4 This lot is subsequently part of Vienna. Information collected from Lyal Taits’ History of Edison Family, and Kirk Barons, Pioneer Churches.